Famously known as Tinea unguium, it is one of the most common infections on the nails. It tends to appear on the nails making them look brittle, yellow, thick, opaque or even white. It is also known as onychomycosis. It can be caused by the use of artificial nails and accumulation of dirt under the nails that aids in the growth of the ringworms. Also known as Tinea barbae. It is common on the face and the areas that have beards. It is associated with crusting, swelling and also hair fall off. It was also known as barber’s itch by those who used to visit the barber’s shop all the time. This is the type of ringworm also known as Tinea faciei. It is common in the facial areas but does not appear on the bearded parts of the face. It has characteristic scaly red patches that have obscure edges. It can be somewhat confusing because the patches do not have a perfect ring shape. Commonly known as Tinea cruris or jock itch. It is common around the thighs up to the groin fold. Its colour is mostly reddish brown. It is most common in mature men and young boys. Mostly, it is caused by wearing tight clothes or pants, sweating or hot weather. These are also scientifically known as Tinea manuum. The appearance of ringworms is not limited to any part of the body. This simply means that the hands are not exceptional. It is common around the finger spaces and the palms. It is the known cause of hyperkeratosis which is also known as skin thickening. 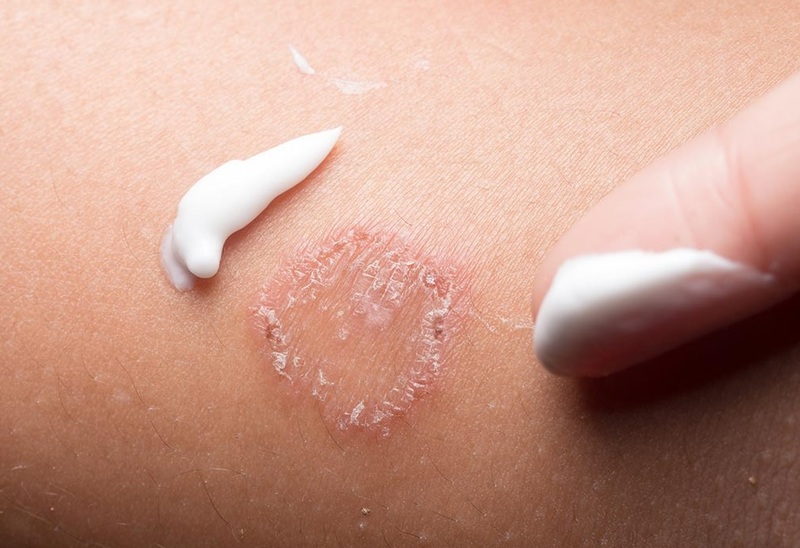 Scientifically, this type of ringworm is known as Tinea capitis. It is common in teenagers. It is known to spread in kids mostly in schools or any other place where children have direct contact with each other. It creates patchy, scaly and bald spots on the scalp. This is commonly known as Tinea pedis. It is one of the most common skin infections which is also known as athlete’s foot. It occurs mostly in the spaces between the fingers with its effects causing scaling and inflammation in these areas. This is the type of ringworm that is also known as Tinea corporis. It leads to skin patches whose edges are commonly defined. Towards the outside of the ring, the skin loos redder while toward the centre of the patch, the skin retains its normal colour. All these types of ringworms can be stopped through the use of ointment for ringworms with most of these ointments having active ingredients such as clotrimazole and miconazole among other products, ringworms can now be effectively and efficiently eliminated. Most of the ingredients that are used in making an ointment for ringworms are also used in the manufacture of cures such best antifungal creams for ringworms that are available in the market. This means that these creams can also help a great deal I the elimination of ringworms threat. The ointment for ringworm help in moisturizing the affected area while at the same time actively acting on the ringworms. They are able to eliminate the ringworms and also protect the body against future ringworms attack. They nourish the skin and help repair the destroyed parts. If your health has been threatening by ringworms, you do not have to worry anymore because there exists an active cure against these pathogens. Your skin must always be protected hence you need to make use of ointment for ringworm. These ointments will fully eliminate the ringworm threat, nourish your skin, repair the destroyed skin parts and protect you against future attacks. With the existence of many ointments in the market, you need to make the best choice to avoid confusion.